'A smart, thrilling, utterly unnerving novel' GILLIAN FLYNN on Andrew Pyper's The Demonologist EVERY FAMILY HAS SECRETS. It is only after their father dies that Aaron, Bridge and Franny learn how wealthy he was. But they must fulfil a request in his will to get any inheritance: spend a month in a cabin, deep in the mountains, with no contact with the outside world. Despite their concerns, they agree. BUT SECRETS CAN BE A REAL KILLER. The isolation soon makes them question what their father was trying to tell them. And why they have memories of the cabin, though none of them have been there before. The only thing they are sure of is that something is calling to them from the darkness of the woods. And before the month is through, they will discover just how deadly secrets can be. 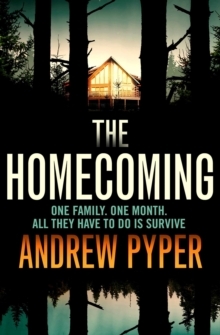 For fans of The Haunting of Hill House, Twin Peaks and Stephen King, Andrew Pyper returns with this gripping novel about the dark side of family. *** PRAISE for ANDREW PYPER *** 'Brilliant thriller . . . readers will be invested in the thoughtfully constructed characters. Fans of Josh Malerman's Bird Box will be pleased' Publishers Weekly on The Homecoming (* Starred Review) 'One assumes the book was written beneath a full moon . . . Pyper's petrifying imagination comes through in the details. The Homecoming creates a battle between the reader's faith in what they know about their own histories and the leery possibility of treachery emerging out of nowhere . . . Pyper's craftsmanship knows no limit when it comes to making the reader confront their own inescapable fears' Globe and Mail 'Weird, wonderful, audacious . . . Brilliantly constructed and absolutely mesmerizing, this could very well be [Pyper's] best book yet' Booklist 'Genuinely terrifying, don't-read-late-at-night stuff. Thrilling, compelling and beautifully written' SJ Watson, bestselling author of Before I Go to Sleep 'Pyper's style flips back and forth from gallows humour to Grand Guignol horror...you'll want to keep all the lights on as you read this one' Independent on Sunday on Lost Girls 'With impressive skill and confidence...Pyper has created an intricate puzzle, playing with elements of the courtroom drama, the detective story and country Gothic...As a debut novel, Lost Girls is remarkable and compelling.